The 28 metre motor yacht Algorythm, listed for sale by Jason Lozeau at Galati Yacht Sales, has had a $500,000 price reduction. 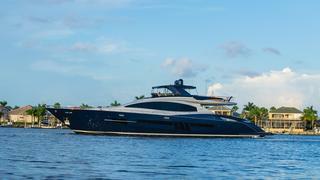 Built in GRP by US yard Lazzara, she was delivered in 2012 as one of the yard’s LSX 92 models. Accommodation is for eight guests in four cabins consisting of a master suite, with a fold-down terrace over the sea, plus three doubles. All cabins have en suite bathroom facilities and are equipped with HD television screens. A large, welcoming saloon has comfortable seating offering an excellent area for relaxation and, notably, the inside helm area was removed to make this area even more spacious. Forward is a full galley with ample casual dining space on leather upholstered seating. The aft deck is sheltered from the sun by the shade of the sundeck above and offers a large space for al fresco entertaining and dining. The flybridge has a range of sun loungers, sun pads and a Jacuzzi spa tub. Another notable feature of this yacht for sale is a large aft garage that, when the toys are out, converts into an outdoor teak-floored beach area. Four 700hp Volvo diesel IPS 900 engines power her to a cruising speed of 25 knots and she is fitted with zero speed stabilizers. The engines have two years of comprehensive coverage followed by three more years of coverage of major components only. The major components coverage is good through to January 14, 2017. In addition the engines and generators have Passport Premiere level coverage until January 14, 2018. Lying in Palmetto, Florida, Algorythm is down to $5,385,000.